Jonathan Garcia is a Massachusetts based aspiring designer and painter. He attends Bridgewater State University majoring in graphic design. His primary focus includes graphic design and painting. Jonathan has been intrigued by art his whole life and briefly studied architecture at Roger Williams University before transferring to Bridgewater State University shifting his focus towards art and design. He has previously been named a Gold Key and Honorable Mention recipient for the Scholastic Art Awards in Boston. Along with his graphic design work, Jonathan is a plein air painter as well. He works in acrylics and is most inspired by the surrounding area of southeastern Massachusetts and capturing the beauty of the region through his eyes. He can often be found at various locations on the south coast plein air painting. His work primarily consists of coastal scenery, cityscapes, and scenes inspired by his hometown in Taunton. 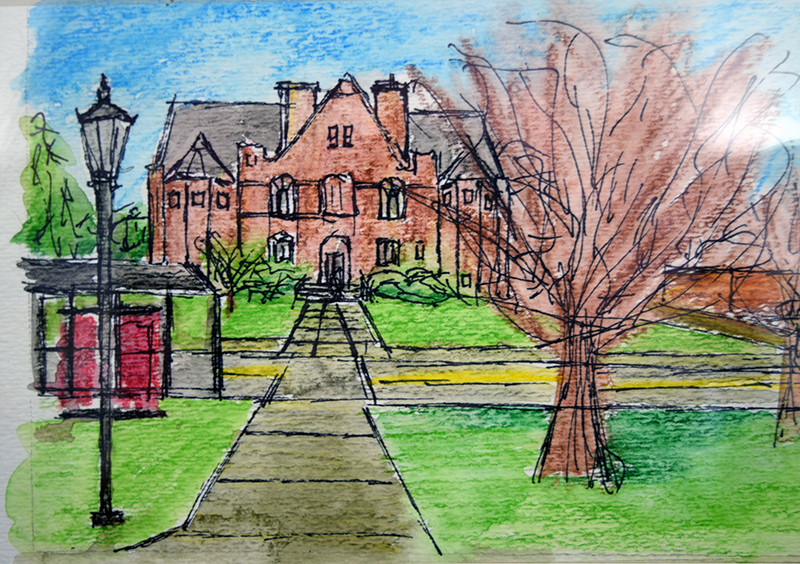 For this series of work Jonathan specifically wanted to focus on loose architecturally based watercolor studies of various buildings and locations throughout the campus. Using a ballpoint pen he sketched out his composition and then applied watercolors to complete the work. His background in both architecture and art inspired this series which was recently completed this past spring. He hopes to complete more paintings and watercolor work of the University throughout the next year. You can find his most recent work on instagram @jonathangarciaart.